The fascinating collection of jewelry made of ostrich eggshells is being assembled by archeologists working in the world famous Denisova cave in Altai region. Ostriches in Siberia? 50,000 years ago? In a month that has seen disclosures of the fossil of a tropical parrot in Siberia from at least five million years ago in the Miocene era , this elegant Paleolithic chic shows that our deep history (some 2,000 generations ago, give or take) contains many unexpected surprises. 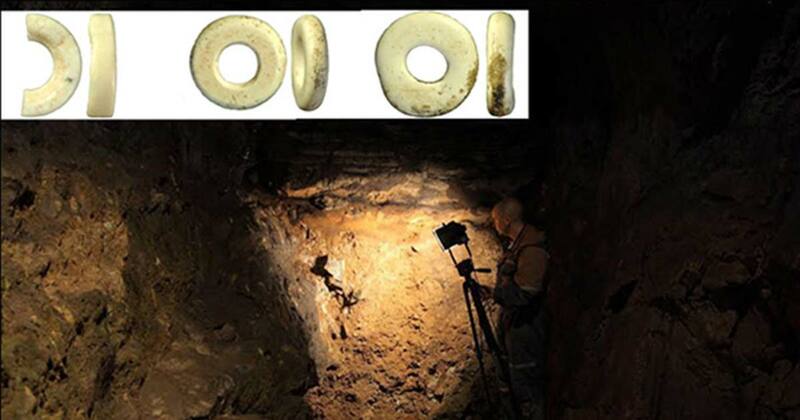 Pictured here are finds from a collection of beads in the Denisova cave, perfectly drilled, and archeologists say they have now found one more close by, with full details to be revealed soon in a scientific journal. They are in no doubt that the beads are between 45,000 and 50,000 years old in the Upper Paleolithic era, making them older than strikingly similar finds 11,500 kilometers away in South Africa. Dr. Lucinda Backwell, senior researcher in the palaeo-anthropology department at Wits University, has previously highlighted how this African proto-civilisation 'adorned themselves with ostrich egg and marine shell beads'. The cave was occupied by Homo sapiens along with now extinct early humans - Neanderthals and Denisovans - for at least 288,000 years, and excavations have been underway here for three decades, with the prospect of many exciting finds to come in future . In August, we revealed the discovery of the world's oldest needle in the cave - still useable after 50,000 years. The article ‘ Paleolithic jewellery: still eye-catching after 50,000 years ’ originally appeared on The Siberian Times and has been republished with permission.